This recipe for Chai Spiced Hot Chocolate combines the best of both worlds. I love the warming and comforting effect of a great Chai Latte and the intensity of a hot chocolate. 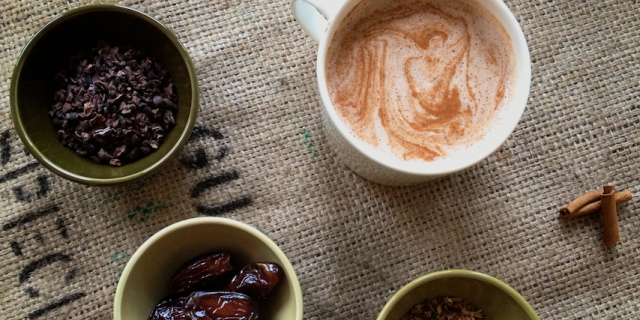 This recipe for Chai Spiced Hot Chocolate combines the best of both worlds. It is the perfect drink on a cold day, wrapped up in a warm blanket. In winter we tend to indulge in our cravings. For most of us when we get a craving, it’s for sugar, especially in the afternoon or right after dinner. This Chai Spiced Hot Chocolate will satisfy your sweet tooth without creating a dramatic spike in your blood sugar levels. The best way to get a quick pick me up while enjoying the sweetness of life. Chai spice blend 2 tsp ground cinnamon ¼ tsp ground cardamom ¼ tsp ground cloves ¼ tsp ground ginger ¼ tsp ground coriander ¼ tsp black pepper 1/8 tsp Himalaya salt Or grind the contents of a bag of Classic Yogi Tea in a mortar and pestle and use instead of the Chai spice blend. 1. Combine all ingredients except for the honey in a high-speed blender. Blend at medium speed until smooth. 2. Check sweetness and add honey to taste; blend once more. 3. Pour into a saucepan and heat, stirring at regular intervals, until steaming. 4. Serve hot. Drizzle with honey and a dash of cinnamon.